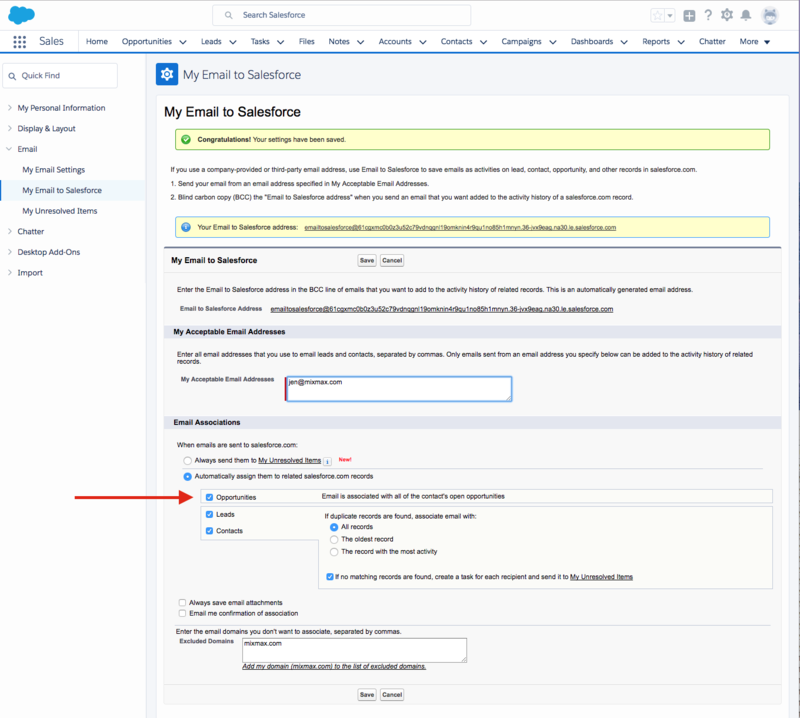 You can sync events like opens, clicks, downloads and replies to the appropriate Opportunity in Salesforce. If events are not syncing as expected, make sure your Mixmax CRMs & Team Live Feed settings are correct, and your settings in Salesforce are correct. We also suggest double checking that the opportunity is set up correctly with contact roles. We've walked through what's required on the opportunity, in your Mixmax settings and in your Salesforce settings below. We are determining which opportunities to sync to based upon contact roles in the opportunity. If the recipient you are emailing is listed as a contact role on any opportunities then we will sync to them in addition to syncing activity to the contact. To set somebody as a contact role on an opportunity follow these steps. When you click that option, you'll be able to add additional contact roles to the opportunity. This will ensure Mixmax syncs activity directly to the opportunity. If the person you are emailing is not listed as a contact role on the opportunity, then the activity will not be synced to the opportunity, only to the contact and account. When you are emailing multiple recipients, only one of the recipients needs to be listed as a contact role on the opportunity for the email activity to sync. Depending on which information you would like synced to opportunities (for example all opens) then it might make sense to include all recipients as contact roles. If you check the box next to Only sync to Opportunities when I'm the owner, events will only be synced to the Opportunity if you are the owner of the Opportunity. If you want emails and events to sync even if you are not the owner of the Opportunity, un-check this box. If you check the box next to Sync to all Opportunities associated with the Account I'm emailing, any time you email a Contact or Lead that is associated with an Opportunity, the event will be synced with the Opportunity. If you un-check this box, events will only sync to Opportunities if the Contact or Lead is listed as a Contact Role under the Opportunity. By default, Mixmax does not sync events to Opportunities that are closed. If you want to sync events to closed Opportunities, click the box next to Sync to Opportunities that are closed. If none of the options under the Opportunity Settings section are selected, we will sync to any open opportunities where the recipient you are emailing is listed as a contact role on the opportunity. 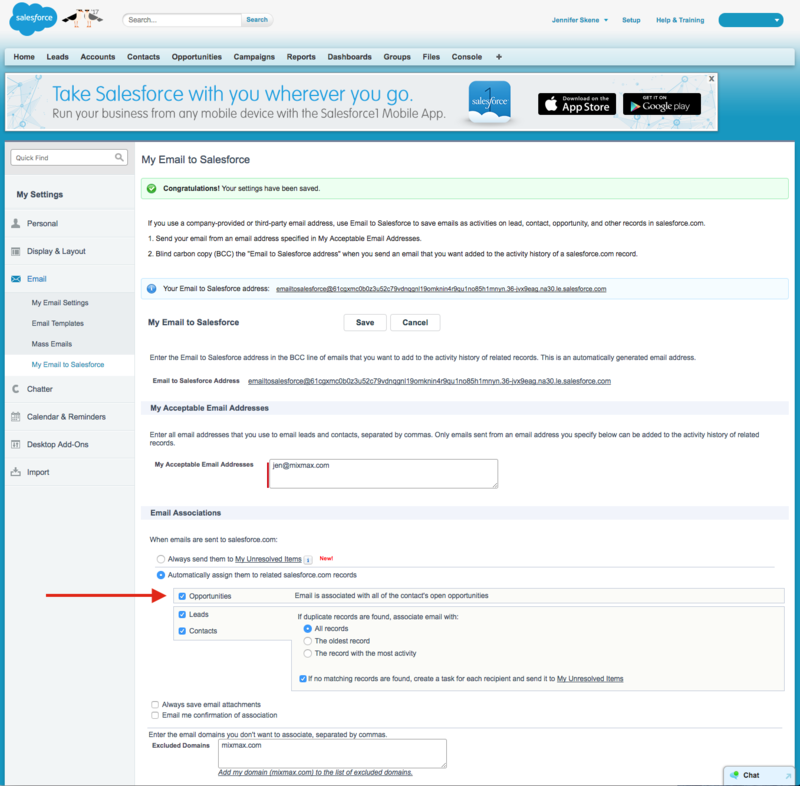 If the above settings are correct and events are still not syncing to Opportunities, you may need to adjust your Salesforce settings. Open your Settings: Click your name in the top right corner, then select Settings from the dropdown menu. Under My Settings on the left, click Email, and then click My Email to Salesforce. Under Email Associations, click the box next to Opportunities. Open your Settings: click the icon in the top right corner, then select Settings from the dropdown menu. In the left column, click Email, and then click My Email to Salesforce. Under Email Associations, click the box next to Opportunities. Does my Salesforce plan include API access?